The secondary school, comprising grades 7-12 offers students the possibility of earning either the American high school diploma or the German Abitur, or both. 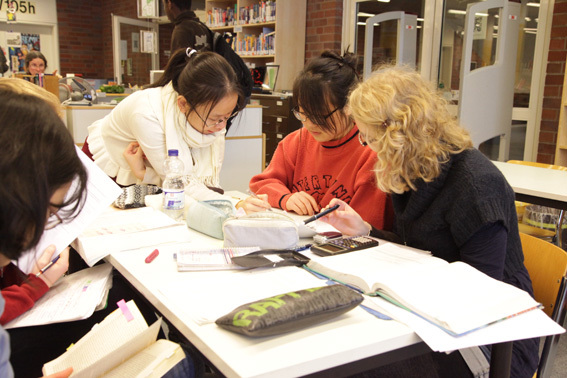 Newly accepted American students receive instruction in English in all subjects except for the German language classes. As their proficiency in German increases, they participate in classes where the medium of instruction is predominantly German. French, Spanish, and Latin are taught as foreign languages. All JFKS students learn both English and German and take mother tongue and partner tongue language courses. Success in Mother Tongue English (E1) and Mother Tongue German (D1) indicates that the student has acquired native proficiency in the language. Partner tongue language courses are more intensive than U.S. or German foreign language study. The German Partner Tongue (D2) and English Partner Tongue (E2) levels indicate a near native level of proficiency, and enables a student to take academic courses in all disciplines in this language. All JFKS courses are college preparatory and lead to the high school diploma. Successful completion of the Abitur program qualifies a student for entry to German Universities. Honors / Advanced Placements courses (or exams) offered in the American Diploma Program include art, history, biology, calculus, chemistry, comparative government, English, European history, French, German, physics, psychology, Spanish, statistics, studio art and U.S. history. The language of instruction may be English or German. German partner tongue proficiency (D2) is recommended for admission to the Abitur natural science program in grades 9 through 10 and is required for admission to the grade 11 Abitur program.